What Were All Those Ribbons At The State Of The Union? : It's All Politics Green ribbons were on prominent display at President Obama's State of the Union address Tuesday night, worn in honor of the victims of the Newton, Conn., elementary school shooting. 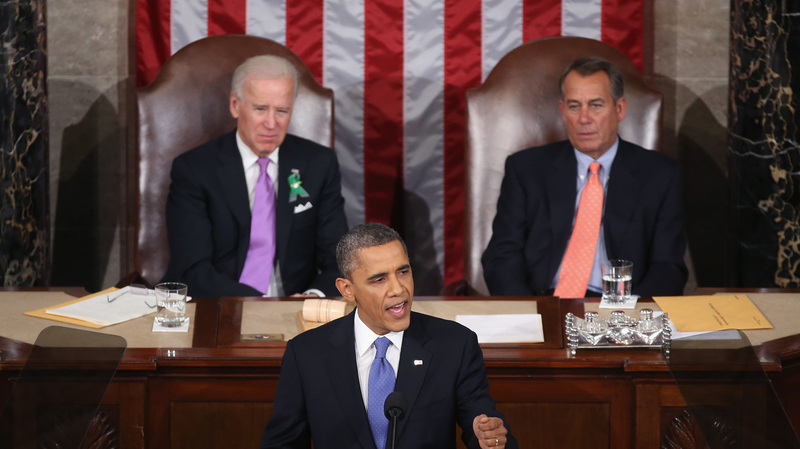 What Were All Those Ribbons At The State Of The Union? Vice President Biden wore a green ribbon in honor of the Connecticut elementary school shooting victims during President Obama's State of the Union address. Green ribbons were on prominent display at President Obama's State of the Union address Tuesday night, worn in honor of the victims of the Newton, Conn., elementary school shooting. Plenty of other ribbons and lapel pins gave visual support to causes. But ribbons in the green and white colors of Sandy Hook Elementary — including one worn by Vice President Biden, who was positioned behind the president on the live television coverage — were the most prominent. Obama included a call for gun control laws in his speech to a joint session of Congress, telling lawmakers that they should act on the measures. "The families of Newtown deserve a vote," he said. The families of many victims of gun violence were invited by the White House to attend the speech. 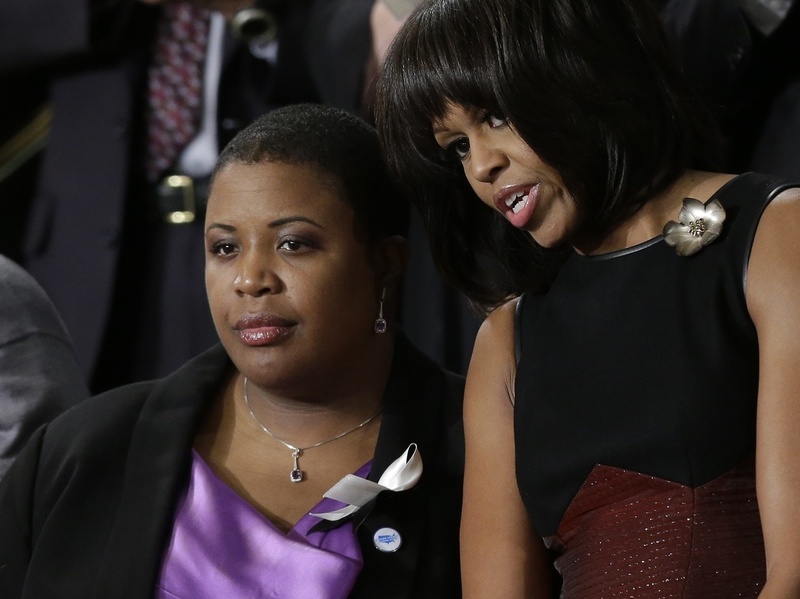 First lady Michelle Obama stands with Cleopatra Cowley-Pendleton, whose daughter was recently shot and killed in Chicago, at the State of the Union address. At Obama's 2011 State of the Union address, lawmakers work black and white ribbons to honor those killed or injured just days before in the shopping center shooting in Tucson, Ariz., that seriously wounded Rep. Gabrielle Giffords. Giffords, now a former member of Congress, was in attendance Tuesday night. The New York Times' Jonathan Weisman reported that the black and white ribbons worn by some again signified the Tucson shootings. The Washington Post's Ed O'Keefe reported: "Others still are wearing white or black ribbons, the colors of choice for two other gun-control advocacy groups, Mayors Against Illegal Guns and the Brady Campaign to Prevent Gun Violence."